What can I say about vegan cheese? I don’t like it. I’m sorry, but I just don’t. Maybe it’s because I was a passionate cheese lover before going vegan. Oh did I love cheese! The stinkier the better. The vegan versions of cheese just don’t live up to my expectations, so I prefer to do without it. However, I decided to give it a try once more with this macadamia nut queso fresco, because you can’t drink a good glass of wine without cheese. 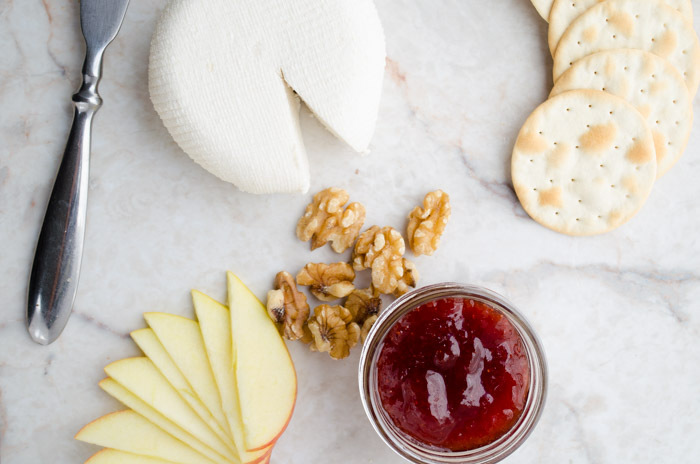 This cheese is perfect for a fruit and jam cheese plate, but also topped with a chipotle-pineapple salsa and some chips. 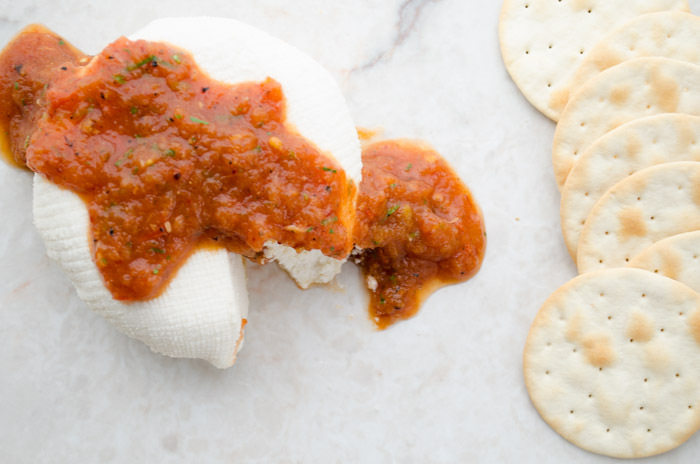 The texture is light and easily spreadable. 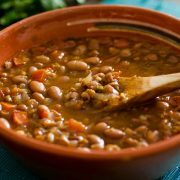 It has a touch of sweetness, but is savory in all the right ways. The best part of it is that it is so easy to make. First you soak the macadamia nuts in water overnight. The following day you grind them in the food processor with garlic, oil, salt, and a bit of lime juice. 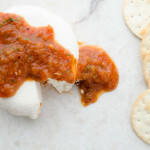 This makes a sort of paste with the consistency of ricotta cheese. You wrap this paste in cheese cloth, squeeze out the excess liquid and leave in the fridge overnight. That’s it, your cheese is ready to eat. 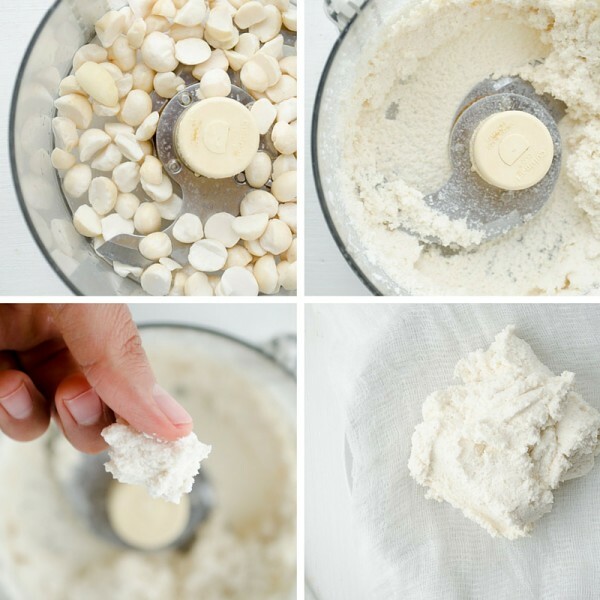 For the queso fresco: soak the macadamias in water at room temperature overnight. The following day, drain the nuts and place in a food processor with the garlic, lime juice, oil, water, and salt. Process 1-2 minutes or until the nuts turn into a paste that resembles ricotta cheese. Taste and adjust seasoning. Wet a large piece of cheesecloth, approximately 12” X 12”. 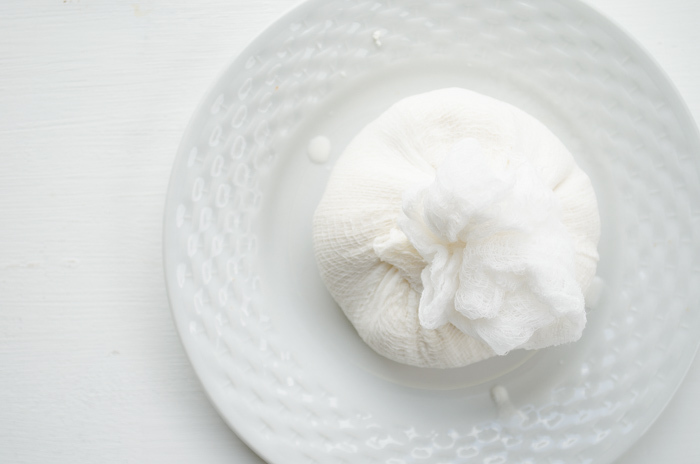 Place the paste in the center and a form it into a ball by gathering the edges of the cheesecloth around the cheese. 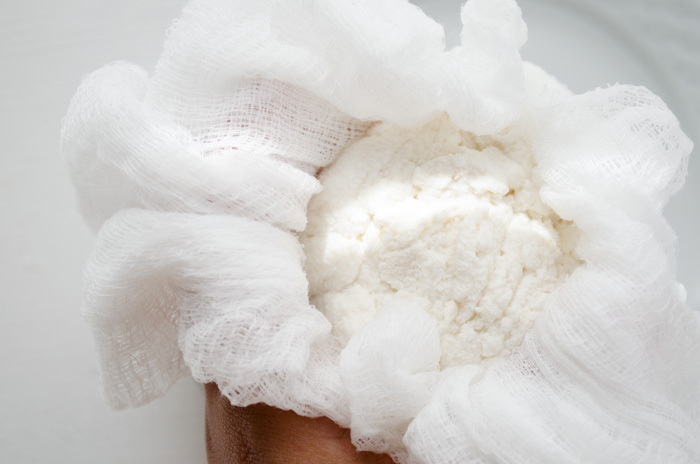 Twist the top edges of the cheesecloth to tighten, give shape, and get rid of excess water in the cheese. 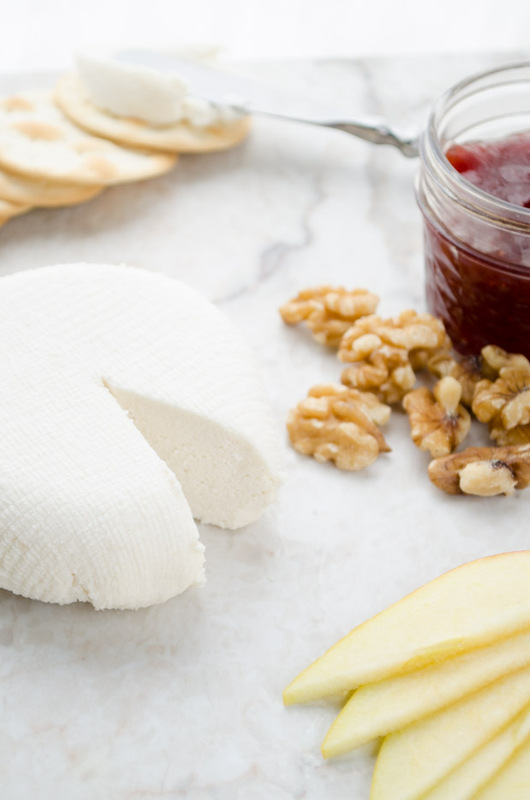 Place the cheese bundle on a plate and let sit overnight in the refrigerator. The next day unwrap your cheese and serve. 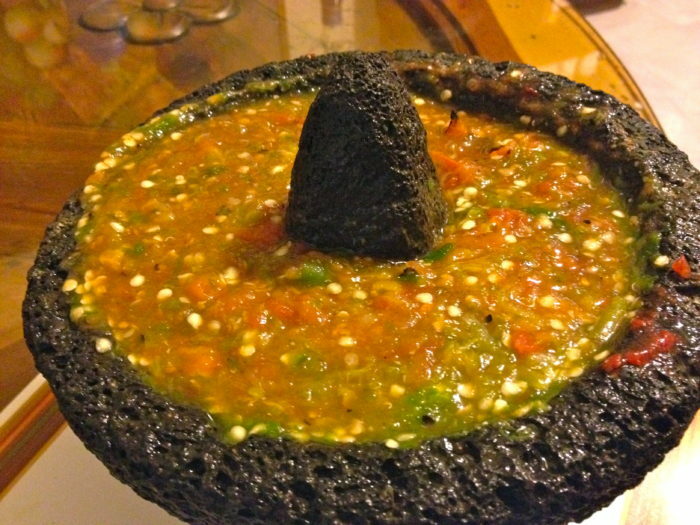 To make the salsa: boil water in a small saucepot. Drop tomato in and lower heat to a simmer. Simmer for 3-4 minutes or until the tomato begins to soften. While the tomato is simmering, set a large sauté pan to medium-high heat. Place the onion and garlic in the pan and let the high heat char them for 2 minutes on each side. Remove from pan, peel the garlic, and place them both in the blender. 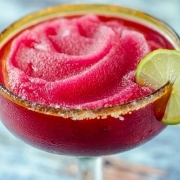 Remove the tomato from the water and add to the blender. Add the chipotle, cilantro, and pineapple to the blender and process until you reach the desired consistency. Season with salt and pepper. If you cannot easily find raw macadamia nuts, you can substitute with blanched almonds. 09/27/2015 /8 Comments/by Dora S.
We love Native Foods too! recently went vegan and it’s been a bit tough at times. I miss my queso fresco mexicano and ditto on the vegan cheese. guacala! anyway, before I get too excited (really, too late! 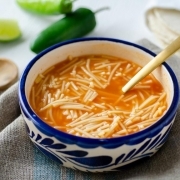 ), does this queso fresco taste similar to queso mexicano? like, where I can have a nice big bowl of frijoles con queso? I know what you mean, it is difficult at times, especially around the holidays when you want to share a meal with your family and they are SO not vegan. Hang in there! This is the only version of vegan cheese that I enjoy so far. 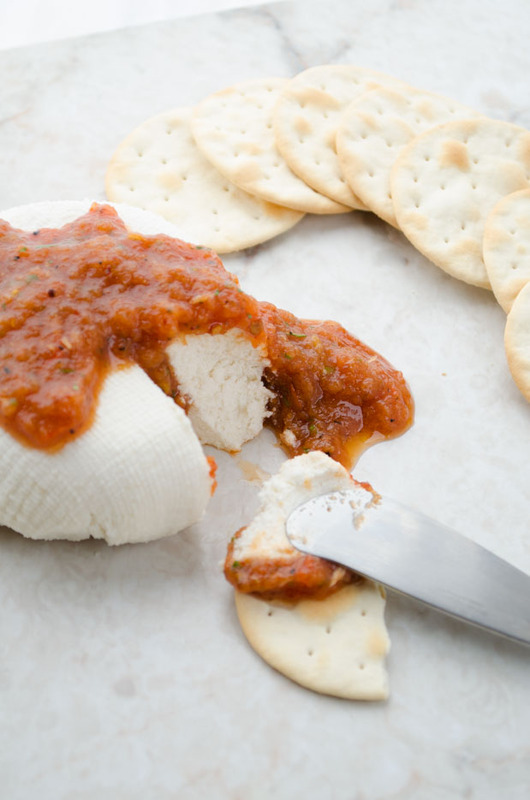 I wouldn’t say it is exactly like queso fresco, but it is a good substitute. Before going vegan I was a huge cheese fan, so that’s why I think I’m not on board with the vegan cheese, but this macadamia nut cheese is very good. 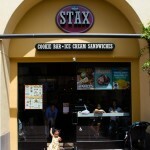 Even my husband like it! One of the tricks of going vegan is to treat foods as individual. 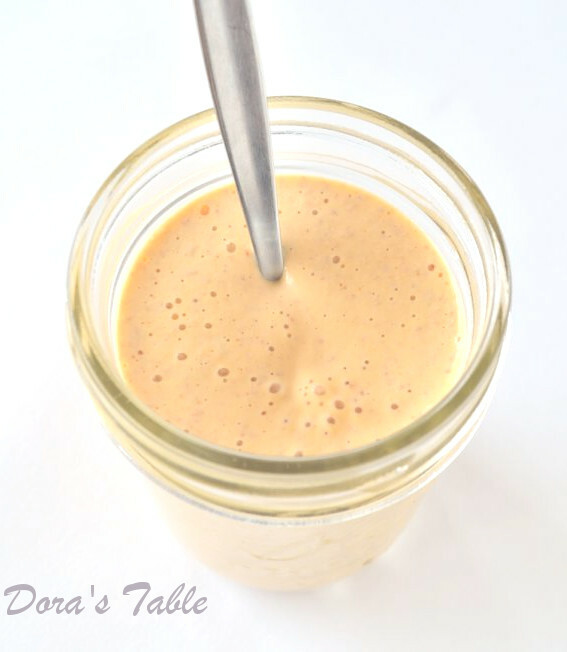 If you taste something, I find it’s less useful to ask, “Does this taste like dairy ___?” Instead, I find it helpful to ask, “Does this taste good?” Veganism really adds so many new opportunities to experience different flavors. It’s hard, but try not to get hung up on looking for direct substitutions. What happens if I soak macadamia nuts that have been roasted and salted, (in fact imported from Hawaii)? Can I use those in place of raw macadamia nuts? You are blessed being in Hawaii and being able to get those nice fancy nuts. Here in California they’re pretty expensive and normally you only find them roasted and salted. Hi Lili, I used to live in CA and I would get the raw macadamia at whole foods in the bulk section. You can also use almonds in place of macadamia nuts. I don’t see why soaking the roasted and salted macadamias wouldn’t work. It is going to change the flavor of the finished product but I think it will still be good. 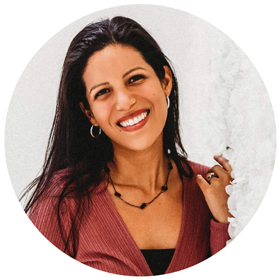 I just discovered your blog and I am obsessed! 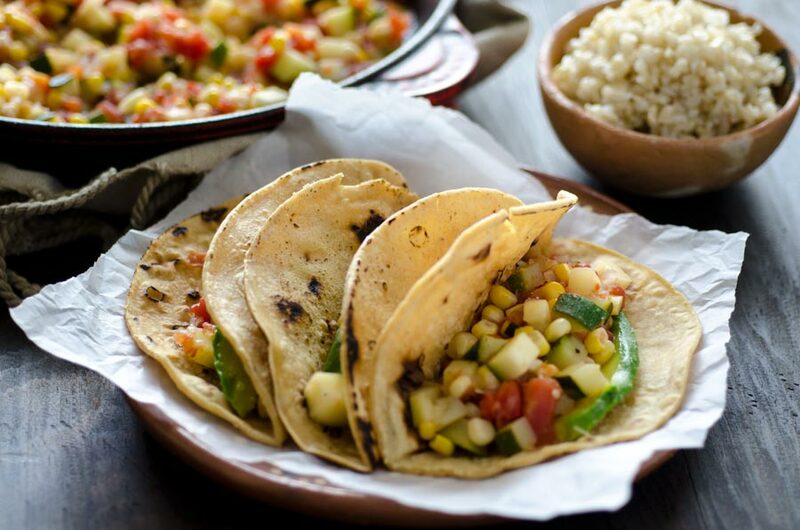 Will be trying this out soon as I do miss queso fresco on my tacos. 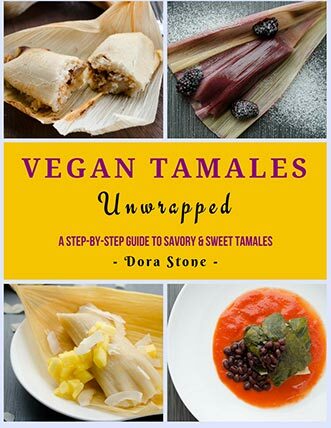 I’m Dora, and I make traditional vegan Mexican recipes that are easy, mostly healthy and delicious. 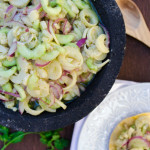 How to make Aguachile vegan? ?